Hamas terrorists in the southern Gaza Strip, Aug. 17, 2017. Credit: Abed Rahim Khatib/Flash90. 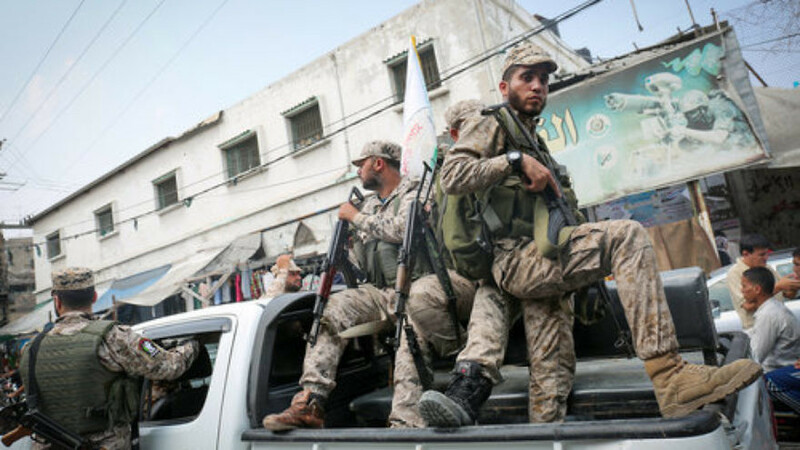 Under the new unity deal brokered last week between the Gaza-controlling Palestinian terror group Hamas and the Palestinian Authority’s (PA) ruling Fatah party, Hamas reportedly agreed to cease all terror attacks against Israelis. The London-based Arabic daily newspaper Asharq Al-Awsat reported Sunday that the unity deal is conditioned upon the rival factions making joint decisions on key issues, such as declarations of war and the signing of any final status agreement to resolve the Israel-Palestinian conflict. The deal contains “an implicit understanding” that Hamas will not carry out terrorism against Israel from either Gaza or the PA-controlled disputed territories, given the PA’s fear that terror attacks could provoke a new round of conflict with Israel, Palestinian sources reportedly told Asharq Al-Awsat. Former PA Foreign Minister Ashraf al-Ajrami—a close confidante of PA President Mahmoud Abbas—told Israel Radio last week that the Egyptian government conditioned the successful enactment of the unity deal upon Hamas implementing a cease-fire with Israel. Yet Daniel Pipes, president of the Middle East Forum think tank, expressed doubt that Hamas would alter its activities. “In the past there have been few Hamas attacks from the West Bank, so to stop them would not be a major change in policy—[Hamas] does not want to run afoul of the PA,” Teitelbaum told JNS.org. According to Israeli media reports, Hamas purportedly set its own conditions to form a unity government with its long-time rival, including demanding that the PA stop arresting Hamas members in the disputed territories. The agreement will see Fatah lifting a number of punitive sanctions it imposed on Hamas-ruled Gaza in return for the formation of a unity government beginning Dec. 1. This would pave the way for the PA to return to Gaza, where Hamas seized power in 2007. The deal also allows for the joint administration of the coastal territory’s borders. The Israeli government reacted to the announcement of the Palestinian unity deal by calling on Hamas to disarm and recognize Israel. “Any reconciliation between the Palestinian Authority and Hamas must include honoring international agreements and the [Middle East] Quartet conditions, first and foremost among them, recognizing Israel and disarming Hamas,” Israeli Prime Minister Benjamin Netanyahu said. Additionally, Israel called on Hamas to release the two Israeli civilians the terror group is holding in captivity—Avera Mengistu and Hisham al-Sayed—as well as to return the remains of fallen IDF soldiers Oron Shaul and Hadar Goldin. Amid the negotiations leading up to the agreement, Abbas demanded that Hamas disarm itself and dismantle its armed brigades before transferring control of Gaza to the PA. Yet senior Hamas member Mousa Abu Marzook recently stated that the issue of dismantling the terror group’s military was not up for negotiation. According to a statement by Egypt’s State Information Service, the Palestinian factions “agreed on procedures” for the reconciliation agreement, but there are still “divisions between the two sides.” Egypt will host another Hamas-Fatah meeting Nov. 21.